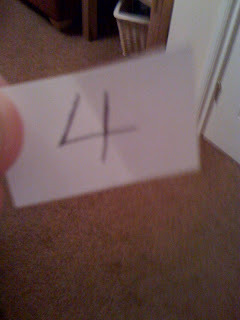 Congratulations Zoe you are the winner if you could please contact me with your address so i can send the candy on to you. I would like to thank everyone that joined in for doing so, but keep an eye out because i will be putting some more candy up for grabs in the not too distant future. 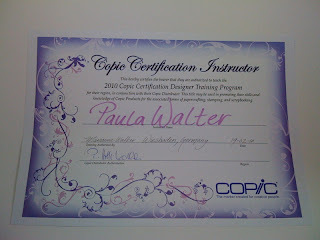 This certificate, issued by Marianne Walker, certifies that i am now one of three qualified Copic Instructors in the UK. You may have seen a certificate in an earlier earlier post.This certified me as a Copic designer. 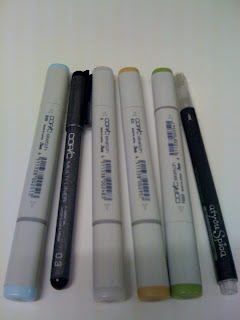 Are you interested in learning more about Copic Markers (alcohol markers) and how to get the best out of what you have purchased or you maybe thinking of purchasing ? Please feel free to contact me at paula@craftycow.me.uk or rachel.byass@homecall.co.uk We are in the process of establishing Introdution to the world of Copic's classes/workshops for any crafters that are interested Rachel and i would love to hear from you if you would be interested. As an initail promotion i would like to offer some Copic Candy 3 copic sketch markers, 1 copic blender, 1fine liner and 1 spica glitter pen. So how do you get to win this candy, please make yourself a follower, put a pic of the candy in your side bar to help spread the lurve. 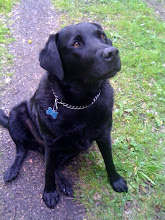 You need to add your name and blog address to the Head and Tail Mr linky below this post. It shall be drawn on the 31st March 2010 at 7pm and the winner will be notified. Best of luck to you all and thank you.